One of the things always mentioned when discussed how to improve a website and its search engine ranking is to do a website competitive analysis. I have been doing for some time but when I think back on my early days I realized that this was a skill that that took time to develop. 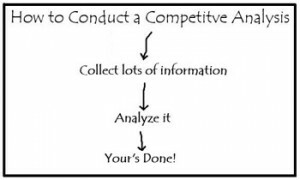 It’s easy to say “do a competitive analysis”, where do you start, what exactly does it entail and what will it do for you? Well to begin with it can help you to market your product or service to the right market, it can show you things you are doing that can hurt your website and things that can help it and lastly it can help to ensure that your online marketing is focused on your business goals. Below are what I consider to be the essential tasks required to prepare for conducting an analysis to take on the competition. • Task 1: Identify Your Competition – We are talking about the competition that rank higher than you on the keywords you are targeting. A quick search on the major search engines (Google, Yahoo and Bing) using your keywords can give you a listing of websites that rank above you on all search engines. Here you are looking for those sites that rank well on all of the search engines, not just one of them. You can also use Alexa to find your competition. Just type in your URL in the Enter Site search bar and scroll down to you come to “What Sites are Related To You” These can be added to the ones you already have gathered and will give you a listing of related sites that you can use for the rest of the steps. • Task 2: Keywords Collection – Here I am talking about identifying those keywords that your competitors are using, and ranking well with, that you have missed. Open Site Explorer is a free tool you can use to discover competitor keywords. Entering your competitors URL and then going to the “Anchor Text Distribution” tab will give you a listing of the anchor texts they are using for backlinks. You can also use Alexa to find the “Top Keywords from Search Engines”, both for your site as well as your competitors. Finally you will find a list of keywords searches that are on the rise that can add to your keyword listing. SEO Profiler provides a tool you to enter all your keywords and then run a report to see how they rank against up to 5 competitors. The Keyword Spy tool in SEO Profiler also allows you to find keywords of your competition that are ranked on Google. You can use these tool during Task 4 to see which keywords are ranked and provide adequate traffic while not being too competitive as well the associated pages you need to improve to surpass your competition. This will immediately show you the keywords for which you rank lower and need work. Finally, you can get additional keyword suggestions from SEO Profiler’s Keyword Suggestion Tool which gives also give you estimates on number of monthly searches local and global. You should now have a listing of sites that you think are your competition and a long list of keywords. It is now time to cut down the list to those that are your real competition and keywords that provide opportunities for increased traffic. • Task 3: Product and Services Analysis – During this step you need to visit each of your competitor’s websites to determine if their products/services are in fact competing against your site. You will need to evaluate if their products/services are same type as yours, in the same price range as yours and are offered to the same market as yours. For example if you are selling a service such as automotive repair and your market is local only in Dallas, Texas, then a competitor you identified that is also local but only offers the same service in the same price range in San Antonio is not really competition. What you are really looking for here is those competitors with the same products or services that are truly competing for the same market as you. Remove all those that are not competing for your target market. You should now have a shorter list of those site you will take the next steps to analyze. • Task 4: Keyword Analysis – In this step you will analyzing the keywords you collected in Task 2 to determine those which offer the greatest opportunity to draw market quality traffic. You will also be using Open Site Explorer to determine which of your competitors are using anchor text linking for those keywords which you are considering targeting. Using the various tools mentioned you will analyze each keyword to cut down your list. You are looking for a final listing of those keywords that offer the most traffic while being moderate to low competition. Although a keyword may offer lots of traffic, the competition for it may so high that you will have difficulty ranking well. It may be better to go after a lower competition keyword that provides less traffic but which you can rank high in search engines. Here you will evaluate each keyword and come up with a final list of keywords that will be easier to rank well for while still having the possibility of bringing in enough organic traffic. • Task 5: Competitor Website Analysis – In this step you need to do two things: 1) conduct an audit of your competition websites to determine if there are any issues that you can avoid and 2) go through their websites to see what they are actually doing that works. This means analyzing their navigation, landing pages, calls to action to determine what you can do better on your website. Again SEO Profiler is a good tool to conduct an audit of their website. What you are looking for is things these websites are doing that you have overlooked such as use of videos, testimonials, social media engagement that you can incorporate into your website. • Task 6: Competitor Backlink Analysis – There are a number of tools available for this step and I prefer to use a combination of tools that includes SEO Profiler, Open Site Explorer and Link Research Tools. You can run reports on all your competitors to see what backlinks they have pointing to them to find opportunities for new backlinks. SEO Profiler and Link Research tools will also show backlinks that they currently have that you want to avoid as well as opportunities that you may not have considered. Keep in mind that what you are looking for are natural links such as industry related directories, trade association websites and local listing services. • Task 7: Social Media Analysis – In this step you want to evaluate what your competition is doing on social media sites, research what sites your target market is active on and what your goals for social media are and how they help to meet your business goals. A helpful tool when going through this process is the QuickSprout Website Analyzer which can give you a wealth of information on both your website and those competitors you identified. By going through the above process you should now have a clear understanding of who you real competition is, what keywords you should optimize your website for to draw in the most traffic, what errors you need to correct on your website, what features you can add to improve your website and how to help your website ranking through backlinking and social media.